Batch Controllers are instruments where we can preset the quantity (volume) required. And the Batch Controller gives a Relay Output immediately after the preset volume is flown. The Relay Output can be used to control a valve, pump, Alarm, etc. Optionally these instruments have a RS485 communication port with MODBUS protocol implemented. Rate of Flow, Total Flow Indication. Microcontroller signal processing. 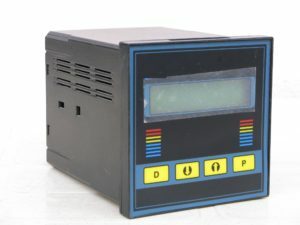 16 Characters, 2 Line Backlit LCD Display. No missing of pulses. Variety of Sensor Compatibility. RS232/RS485 – MODBUS Communication. Field Programmable through four keys. Compact Size. Controls Valve, Pump, Alarm, etc., automatically.